2013 Ford Fusion Pros and Cons: Why (Not) This Car? With everyone in the hyper-competitive segment seeking to please, well, everyone, even good midsize sedans—and the current crop is generally good—struggle to distinguish themselves. 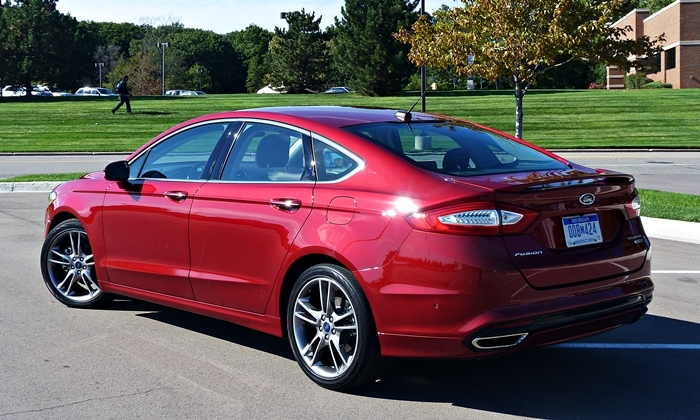 Ford tried to make the 2013 Fusion both the best in everything AND different. Just the usual talk? For once, the car backs it up. Good materials, more restrained styling than in Focus and Escape. But why only offered in charcoal? 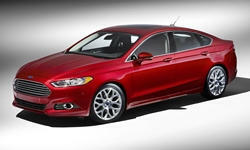 Why the 2013 Ford Fusion? The new Fusion does so much so well that ranking its top five strengths isn’t easy. I've opted to start with handling, as it’s the area where competitors fall short. Most don’t handle badly. They’re just boring. The new Fusion, in contrast, actually comes alive when hustled. Its steering, though not sportily quick, is well-weighted, feels "natural" despite its electric-assist, and even provides feedback. Its suspension corners precisely and controls body motions extremely well, much in the manner of the best German sedans. When you want to feel connected to this car, you do. Ex-affiliate Mazda has historically led the segment in handling. This is the car for the 2014 Mazda6 to beat. Among the Fusion variants, the 1.6T/manual handles best. The 200-pound-heavier, significantly quicker 2.0T feels somewhat less agile, and the Hybrid feels less agile still. But all are considerably more satisfying along a curvy road than their key competitors. Update: A week with a front-wheel-drive Fusion SE 2.0T demonstrated that the 2.0T engine's torque is more effectively transferred to the road when all four wheels participate. The SE's 235/45VR18 Goodyear Eagle LS tires might also handle less sharply than the Titanium's optional 235/40VR19 ContiProContacts. Though still impressed with the basic competence of the chassis, I did not enjoy the handling of the front-wheel-drive 2.0T car as much. Ford's recent small cars have looked and felt considerably more expensive than their sticker prices. But they were engineered by Europeans with the higher-priced European market in mind. In line with CEO Alan Mulally's "One Ford" strategy, the new Fusion was also developed for world markets, but mostly by Ford's North American organization. Has it consequently suffered from the imprecise assembly and mixed materials quality that plague larger Fords? Not that I could tell. Though room has been left for the upcoming Lincoln MKZ, materials are nearly without exception very good and fits are tight and precise. With the 2013 Fusion (unlike the pricier Taurus) Ford's people paid close attention to how everything looks, sounds, and feels, and it shows. Among competitors, only the Malibu might be better here. Most others aren't close. More than a little Audi A7 from this angle. MyFord Touch includes fancy gauges. The front bucket seats fit my slightly overweight torso very well, with large bolsters for lateral support, a form-fitting shape, and headrests that don't jut too far forward. The Titanium's seats are the best of the bunch, with a little more padding and a little more bolstering. The rear seat doesn't seem as roomy as the official legroom specs of 44.3 + 38.3 inches. In the back seat of a VW Passat (42.4+39.1 inches), my knees aren't nearly as close to the front seat backs. Though those present denied it, I continue to wonder if the specs have been cheated like those for the new Escape. 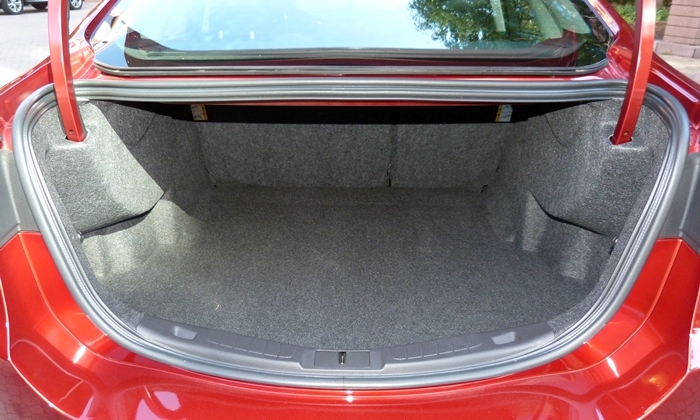 Passengers over six feet in height will find rear headroom in even shorter supply. 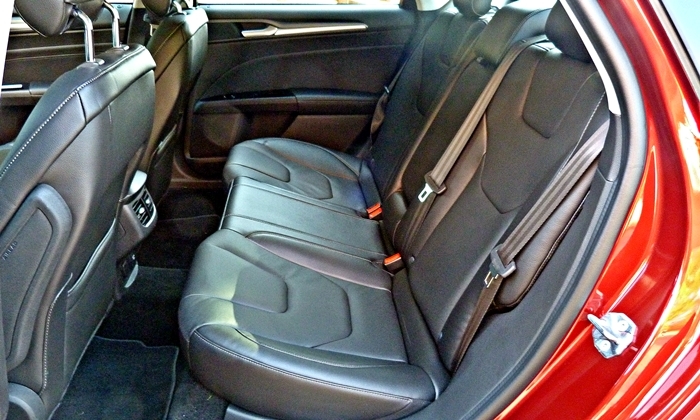 But if you fit, the high-mounted, large, and well-shaped cushion is the most comfortable rear seat in the segment. Other reviewers might actually put exterior styling first. Compared to competitors, especially the best-sellers from Honda and Toyota, the new Fusion looks stylish and expensive. Others have attempted a coupe-like roof line, but no one to date has done it this well (with the Mazda6 still to arrive). So why have I put exterior styling fourth? Though large, five-spoke wheels (such as those optional on the SE and Titanium) help quite a bit, the midsection appears disproportionately distended when viewed directly from the side. And the grille opening is overly derivative of Aston Martin. But I'm picky. Most people will just see a fine-looking sedan. The 2013 Fusion looks and feels expensive. Designed to serve the European as well as the North American market, I very much expected Ford, like VW, to have to price their car at the top of the segment. Instead, they've priced it near the bottom. For the best handling, get the SE 1.6T with Appearance Package and manual transmission for $25,745. Add $1,000 for the controversial MyFord Touch package (more on this in a bit). For performance, luxury, and many additional features, get the Titanium for $31,690. For either, add $795 for nav and $895 for a sunroof. Seem steep? Especially once you adjust for features (the Fusion is packed with them) others cost more, details here. Why Not the 2013 Ford Fusion? Given the new Fusion's swoopy styling, I feared that the view forward from the driver seat would be horrific. So during the preview drive I was pleasantly surprised to find the driving position acceptable. But many competitors provide a much more expansive and immediate view of the road ahead, which aids driver competence and simply makes a car more fun to drive. I wish the Fusion's instrument panel was lower and not as deep. Though the Fusion's exterior design is a clear strength, it doesn't look nearly as good in light colors. 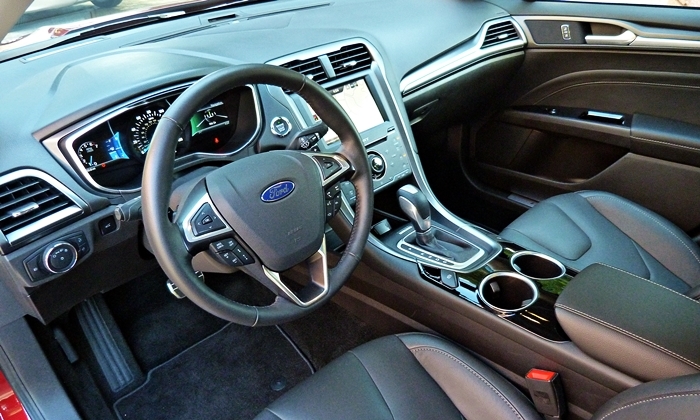 But the big color problem is inside the car, as the Fusion's interior is devoid of color aside from the vivid MyFord Touch displays and the Appearance Package's red seat stitching. The S and SE are available with only beige and charcoal interiors, the Titanium only with charcoal. You can spec a much warmer ambiance inside the Chevrolet Malibu. The first time I saw one of these approaching in my mirror, I thought it was an Aston Martin. Best-in-class comfort, even if the specs are dubious. 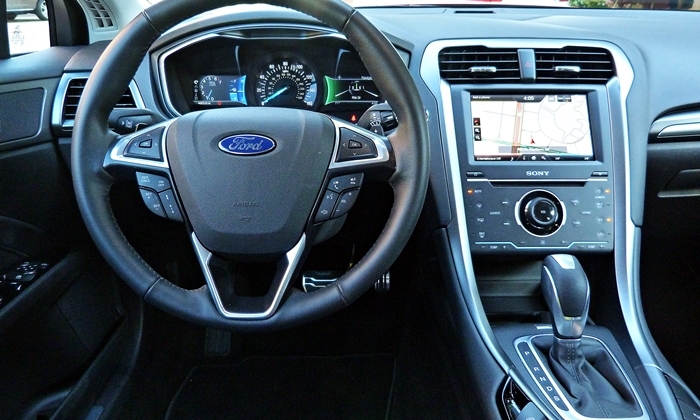 The MyFord Touch control system, optional on the SE and standard on the Titanium, has been widely criticized as too difficult to operate while driving. Though it's been through a few rounds of tweaks, some screens continue to contain too many overly small buttons. But the system is better executed in the new Fusion, as the screen is much closer and mounted flush with the center stack rather than recessed within it. The controls standard on the S and SE include conventional knobs and buttons, but too many of the latter, and those for the audio system are far from intuitive. The new Fusion's most powerful engine (until a future high-performance variant arrives), the Titanium's 2.0-liter turbo, has a peak output of "only" 240 horsepower, 40 short of the segment leader, the Passat V6. Like other fours, it also doesn't sound as sweet as a good six. In its defense, this engine leads the segment in terms of midrange power, as indicated by a peak torque figure of 270 pound-feet, a dozen over the Passat and one over the Hyundai/Kia boosted four. (The SE's 1.6-liter turbo similarly trails others' 2.5-liter non-turbos in peak power but roughly matches them in the midrange, where engines operate in daily driving.) More of an issue than engine power: the transmission's performance is at best average. Shifts aren't quick, and at times when I wanted to scoot the transmission hesitated. Competing transmissions, especially VW's DSG, are better partners. I actually like the Fusion's ride. It's decidedly firm, but well-controlled. But some people will desire a cushier ride. The Chevrolet Malibu is the champ here, but you pay a hefty price when the road turns. 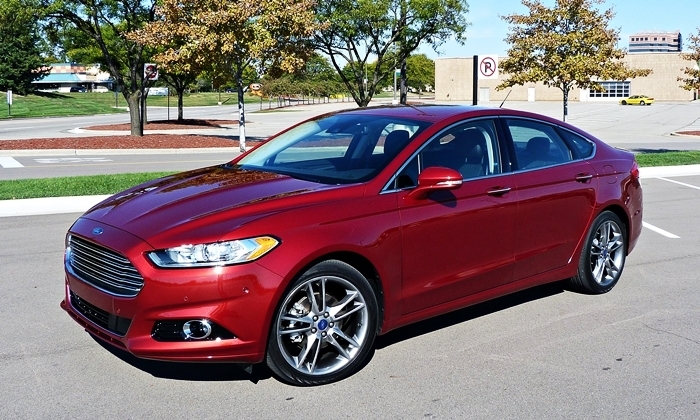 With the 2013 Fusion, Ford has somehow evaded the tradeoffs that mark other midsize cars. The new car has a stylish exterior with a roomy and comfortable interior, premium materials and extensive features with an affordable price, and engaging performance with good fuel economy. Unknown reliability is the only significant question mark. Ford plans to manufacture the car in five factories around the world. They could all end up busy. Torquey, but a V6 would sound sweeter. Not the roomiest, but not far off. Preview drive. Ford provided insured and fueled cars along with a light (but well-done) lunch. 2013 Ford Fusion pros and cons, according to Michael Karesh: the best reasons for buying (or not buying) the 2013 Ford Fusion. Join TrueDelta to post your own impressions.